The bathroom is today one of the most important rooms in the house: it’s no longer only a service area, but also a wellness and self-care place. 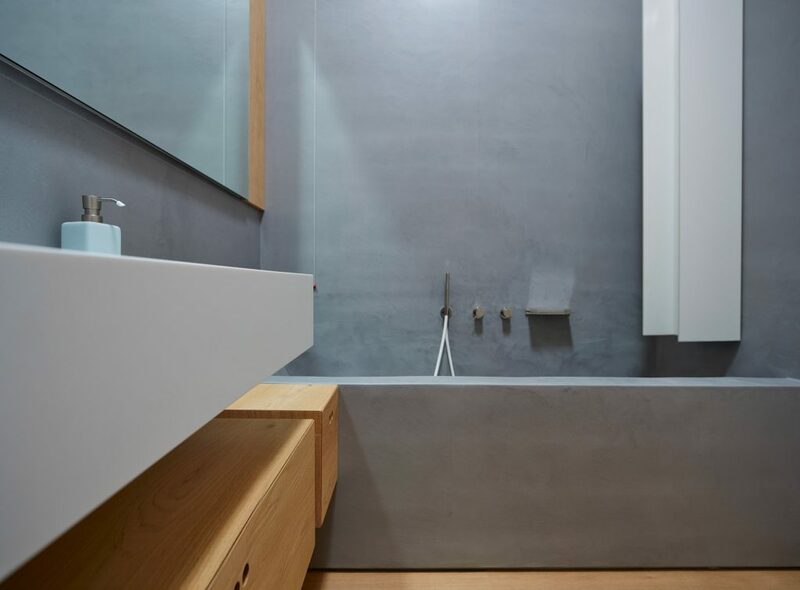 If you have a classic narrow bathroom, coated with traditional tiles but you’re looking for an original look, don’t worry: there are several solutions such as concrete, that allow you to renovate your bathroom without demolishing the existing surfaces. With Ideal Work solutions you can therefore restructure your bathroom in a quick and less expensive way, with a result of a high aesthetic value. For a new, modern and practical bathroom. Amongst the various modern bathroom coatings, Ideal Work’s solutions allow to create an ultra-contemporary look. 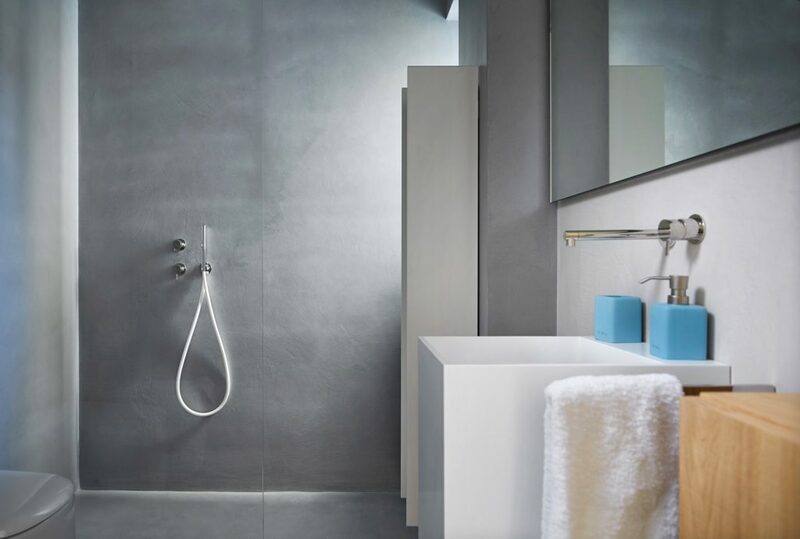 Whether you have a small or long and narrow bathroom, Ideal Work®’s solutions are perfect because their minimalist aesthetic builds a neutral background that visually enlarges the space. In addition to that, they match the most various styles: from essentiality to a rétro or baroque style, from the optical to the nordic look. They also match almost every material: from wood to glass, ceramic and even stone. For a custom-made bathroom. BATHROOM FLOORS, WHICH ONE TO CHOOSE? Among Ideal Work®’s modern bathroom floors and coatings, Microtopping® and Microtopping® Wall Textures turn the bathroom into a modern and original eclectic space. 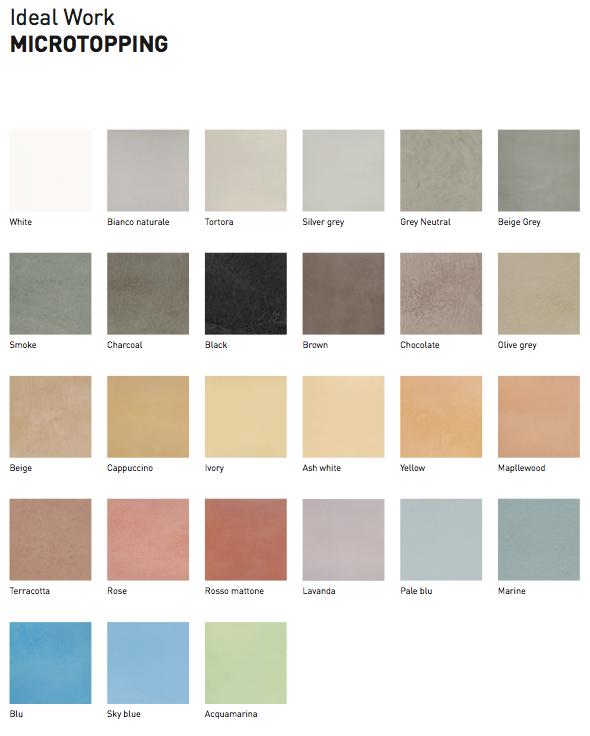 Available is endless colour shades, from black to white, from concrete to terracotta and aquamarine, Microtopping® matches every house’s style. Microtopping® Wall Textures has been specifically designed for vertical walls and surfaces and is customizable not only with the colour choice, but also with a wide range of effects: from hemp to leaves, from jute to wood and many more unique textures. Only 3 mm thick, Microtopping® can cover any surface, horizontal or vertical, and is therefore ideal for bathroom renovations: Microtopping® allows to coat the existing surface without demolitions, with remarkable advantages in terms of time and costs. 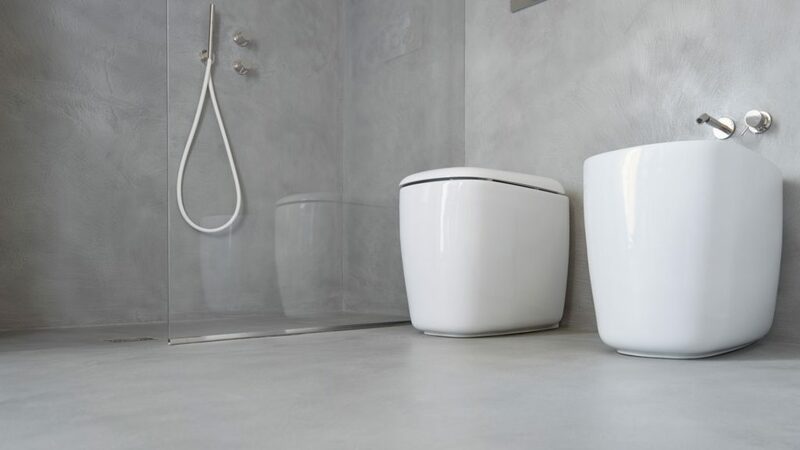 Available in several colours, Microtopping® gives any space the chosen look: black Microtopping® matches the white colour of the toilet and the accessories for an optical-chic space. The Characoal shade matches wood for a nordic style.. and for those who look for even more original ideas, there’s Microtopping® Wall Texture: wood, hemp, jute and brick texture effects for a unique bathroom. Both these solutions are seamless coatings, therefore easy and quick to clean. 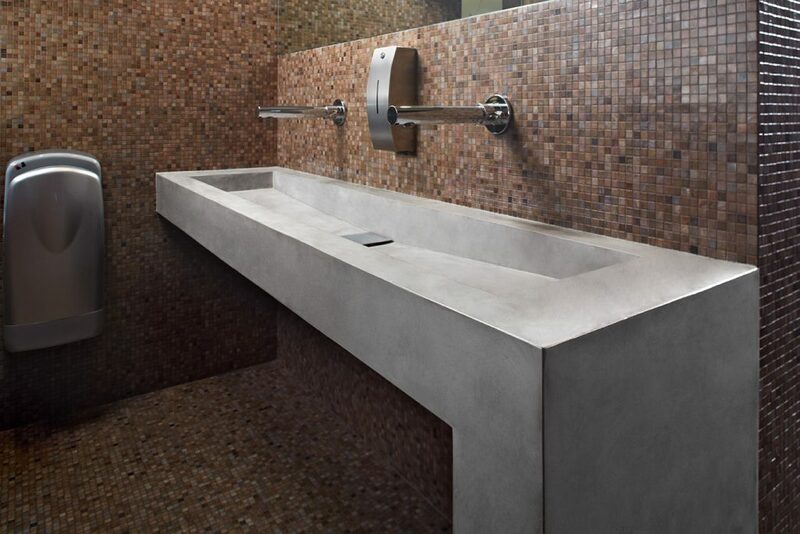 The seamlessness also allows to visually enlarge the spaces, and is thus perfect for small and narrow bathrooms. With Ideal Work®’s solutions, the bathroom renovation time is the least possible, and so are the building site’s costs. These low thickness solutions (only 3-6 mm) are able to cover old ceramic tiles, wood, marble, concrete, glass and gres without the disadvantages and the costs of annoying demolition works to remove the old surface. Moreover, there is no need to cut the doors. The price of the bathroom renovation depends on the type of surface chosen and on the room’s size. In comparison with the traditional tiles, Ideal Work®’s low thickness surfaces allow to renovate the bathroom without demolishing the pre-existing surfaces and without cutting the doors. This way the building site’s time and costs are considerably reduced. Whether in a minimal or an industrial style, for a house, a restaurant or a bar, here are some ideas for an original and always contemporary bathroom. Clean and geometric lines for a bathroom in Castelfranco Veneto. Microtopping® in the CHARACOAL shade covers the old pink tiles and gives continuity to the interiors. It enlarges the space and makes the environment brighter. Grey Microtopping® gives continuity to the interior spaces of a restaurant on the island of Cipro. 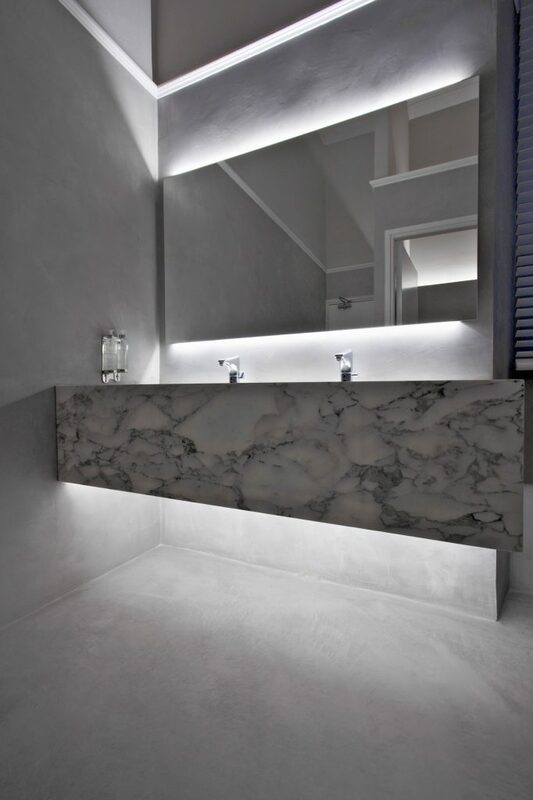 Applied also to the bathroom, Microtopping® combined with some LED lights turns the space into a hi-tech fine environment. An industrial concrete effect for a refurbished restaurant. Microtopping® has been used to cover the floor, the stairs and the sinks of the local’s restroom. 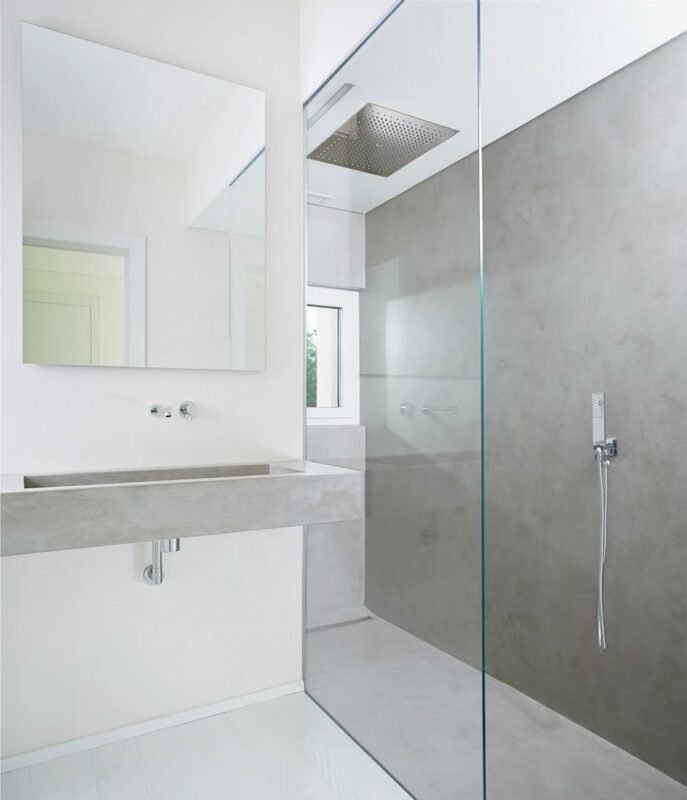 Microtopping® coats the shower stall and and the sink of a bathroom with a minimalist look, adding warmth and tactility to the dominant white colour that characterise the space.